People who are already interested in building houses with shipping containers may have seen a few different options for how to lay out one or two or even more large shipping containers, but this is one of the nicest looking jobs of a shipping container home using just one container bin, which would cost around $2000 or so. The price of the shipping container home will be more than the price of the metal bin, of course, but the basis is that bin. On this one, they’ve just set it up on simple blocking — no elaborate foundation — which is an inexpensive and non-invasive way to set a shipping container house (or prefab house or modular home, for that matter), down on its building site. Already the style element enters, because they’ve opted for thin rectangular columns on the overhang. But now the style really kicks in. 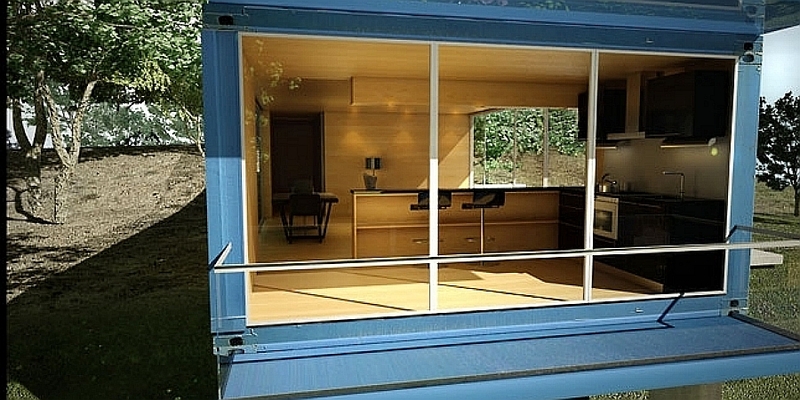 Normally, the blue color of the shipping container house would be something conspicuous and possibly be something the house builder would want to avoid, but here the blue contrasts with the yellowish interior wood, the green folliage and the whitish columns and deck (and furniture) to make the blue look purposeful. Similarly, the squareness and the vertical lines of the shipping container home walls are complimented by the vertical window dividers and the horizontal patio railing. They coated the container house with ecological heat insulation, which is cotton based, and therefore provides some sound insulation as well. It also has a special membrane of waterproofing to the container bin, so it can have a green roof — see the plants growing on the roof? You might have missed that in the photo. It’s like a nature garden up there. One of the great things about this design is they made something here that can look good, but that you can build with just one inexpensive used container bin. Here they used two short containers, and whether you use one longer or two shorter makes almost no difference to the design, but the reason I’m saying go with the one longer one is that you don’t have to join the two — you’d just set it down and get to work. Because you can get them second hand usually, you won’t know until you shop around which option (one or two bins) will be cheapest for you. If you go with two bins, each will be 5.10 meters by 3.2 meters by 2.2 meters tall. So overall the building is 10 meters long. If you go with one longer shipping container, obviously you get a 3.2 by 10 meter bin. You can get shipping containers used in lengths even around 40 feet, so you can go a bit longer even if you go with one bin. 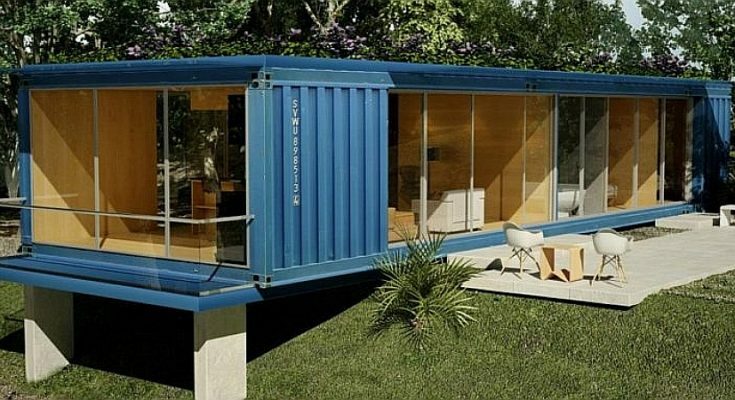 You might want to build just like this shipping container house, but have some storage space / guest space or maybe a wood shed area on the end. That wood, if you were wondering, is beech wood, and they used it throughout the shipping container home, except the bathroom, which you can see in the photo is a pale grey. They used cement mortar for that, and all the glazing is triplex safety glass. 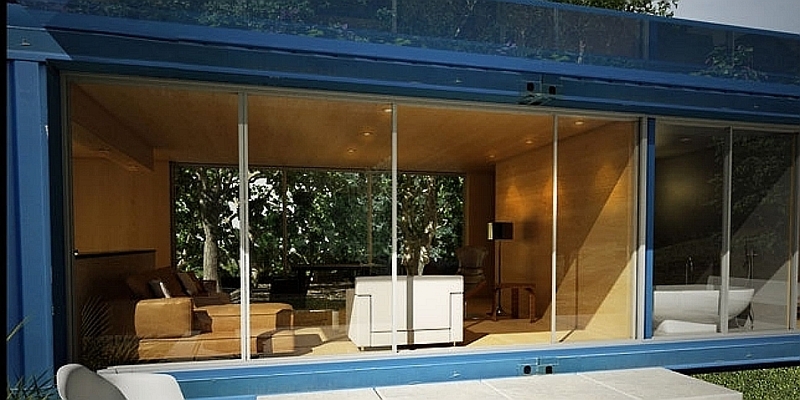 This luxury container home was designed by Greek firm Zelhs. For more prefab homes, modular homes and tiny houses (including shipping container homes and builders), find them in our directory.